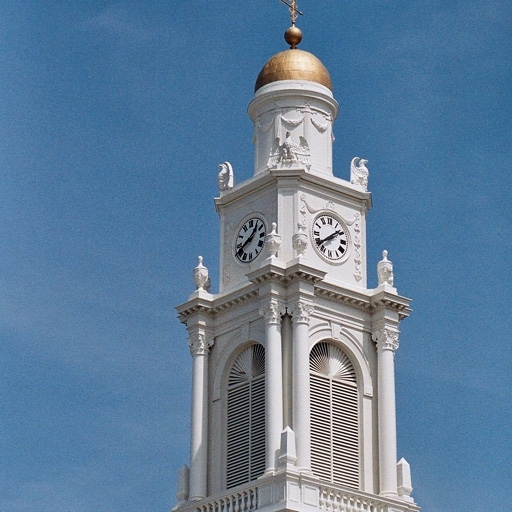 The architectural fiberglass cornice and panels of this bell tower are attached using the Stromberg Z clip method. Architectural fiberglass is being used in more restoration and construction projects as its flexibility, versatility, durability and value are recognized. Unlike other materials, the installation process for fiberglass materials is fast and easy, reducing labor and helping to complete restoration and construction projects on schedule. When it comes to the type of architectural fiberglass product applications, there is a diverse array to fit every project, including everything from columns, cupolas, and medallions to bas relief, keystones, and fireplaces. With these products comes a unique installation process that Stromberg has developed to attach these products to an existing interior or exterior area of a structure. Since architectural fiberglass is lightweight, it is easier to install and attach. Architectural fiberglass products require a mounting and installation process that will ensure a good fit and attachment to ensure safety and security over the long term. The primary attachment system used for our architectural fiberglass is the Z clip system. This system involves a series of clips that works as part of an interlocking system. One Z clip is attached to the fiberglass panel or product while the other is attached to the supporting structure that it will be mounted onto. This interlocking system allows the architectural fiberglass to be put into the desired position quickly. Another advantage to this Z clip system is that because it locks into place, it offers a solid and secure way to attach architectural fiberglass products so that they are guaranteed to stay in place regardless of whether inside a building or exposed to the elements outside. However, if the architectural fiberglass has to be removed for any reason, it can also be dismounted in a matter of seconds. The Z Clips are also completely concealed behind the architectural fiberglass so the installation can be prefinished, saving further time and labor costs. As part of the process of working with Stromberg, we provide a library of information available to architects and construction companies that offer specific instructions for each type of architectural fiberglass product we custom create. This library features detailed CAD and instructions for mounting and installing any of our products. These drawings provide detailed renderings to help speed the installation process. The visual drawings show you, step by step, how easy it is to mount architectural fiberglass products with this system. However, our team of architectural fiberglass professionals is available to assist with all aspects of your fiberglass installation process and can answer all questions you may have in terms of working with this Z clip system. The Stromberg Architectural Products team has created a wide array of architectural fiberglass attachments for thousands of projects and structures all over the world. Now it’s your turn to discover how architectural fiberglass products can work for you. Get your free custom quote by calling 903-454-0904 or filling out our online form.